After spending roughly ten years as an automotive technician and almost two decades as a vehicle inspector, I have seen my fair share of engine failures. On average, I will inspect six to seven cars a week that have some sort of engine problem, ranging from issues that could be fixed relatively easily to catastrophic failures. In this post, we will concentrate on engine failures that will require the engine to be replaced. Recently I asked three other vehicle inspectors about what they typically see in the field in regards to the most common causes of engine failure. This is what we inspectors see several times a week. This is one of the most common failures that we come across. When we go into a repair facility to inspect a vehicle that has an engine issue, one of the first things that we check is the cooling system. Specifically, we check the coolant level and for any signs of leaks. Usually, when we look at an overheated engine, the event that started the failure can be traced back to low coolant levels, a faulty water pump, or a leaking radiator (or one of its hoses). In addition, a defective thermostat and inoperative cooling system fan can cause an engine to overheat. This is one of the reasons why it is so important to keep an eye on the temperature gauge. It’s important to know what’s normal for your vehicle. For instance, if the temperature gauge on your car is normally right below the halfway point, any deviation is a good clue that something is amiss. Also, periodically checking your parking area for any signs of leakage would be a good idea too. This is pretty self explanatory. Not keeping up with the manufacturer’s recommended service intervals will hasten the demise of an engine. All car companies provide recommended maintenance schedules to their customers. Failure to follow these guidelines can be detrimental to the health of your engine. Most professional technicians that I know will change their oil and filter a little before the recommended mileage or date. For instance, if the service interval says the next oil change is due in 7500 miles, he or she may change the oil at 5500 or 6500 miles. Changing the oil and filter on a regular basis is a relatively inexpensive way to help keep your engine mechanically sound. 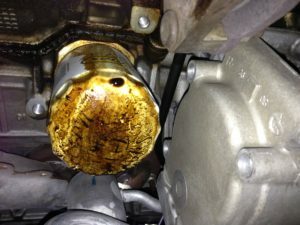 Oil pump failures are not as common as they used to be, but they still happen. 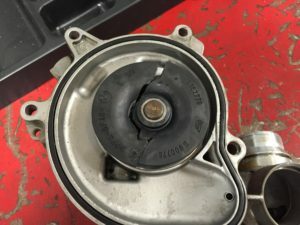 This could be an oil pump that is simply not producing the flow that is needed to properly lubricate the moving parts of the engine, or a pressure relief valve that is stuck in the open position. Both of these conditions will cause lower than normal oil pressure. Conversely, if the pressure relief valve is stuck in the closed position, engine oil pressure can rise and eventually cause engine damage. Since the pump pulls the oil from the sump, we have to remember that the oil coming into the oil pump has not been filtered by the oil filter. This is another reason to change your oil on a regular basis. Another form of lack of lubrication is lower than normal engine oil levels. Oil that is lower than normal may not properly lubricate areas of the engine that rely on a steady supply of oil to operate correctly. In addition, the lower level of oil has to work harder to remove deposits, acids and other contaminants that are present under normal engine operation. The correct amount of oil is also important because it helps remove heat that is produced during each combustion event. Since a good number of modern cars will have low oil level indicators or sensors that will alert the driver when the oil level is too low, this isn’t as big of a deal as it used to be. For peace of mind, though, I would recommend manually checking the oil level. If the engine does not have a dipstick you will have to follow the manufacturer’s instructions regarding proper ways to check the oil. As a precaution I would also recommend that you or another person check the engine oil level after getting your vehicle serviced. Over the years I have repeatedly inspected engine failures that were due to the technician or lube specialists not adding the correct amount of oil to the engine after the service was completed. From time to time a fellow motorist will ask me if they have to get their oil changed at a dealership. My answer is always no, you do not have to go a dealer for an oil change, but you need to make sure the repair facility that you choose uses the correct oil and a good, quality filter. In my work as a vehicle inspector, I have routinely witnessed manufacturers and service contract providers deny claims because the owner or the repair facility used the wrong type of oil and/or an inadequate filter. Whenever this particular topic comes up, my advice is to follow the manufacturer’s instructions and recommended service intervals. As an example, my wife’s car is still under the factory warranty. Even though I change the oil myself, I always purchase the oil and filter from the dealership. The added peace of mind is well worth the extra $10 or $15. This is important if there is a future problem that requires proving the vehicle has been properly maintained. When we see abuse in the field, it is usually due to the engine being operated at higher than normal speeds. When I say “speed”, I am referring to the engine’s revolutions per minute. With high engine speed typically comes high engine loads. In simple terms, the “load” is how hard the engine is working at a particular moment. Higher loads mean the engine is working harder, which in turn produces higher combustion pressures and temperatures. The higher combustion pressures and temperatures also make the cooling system work harder because the additional heat is being transferred to the coolant. Driving a vehicle for a long period of time while the engine is a under a high load can cause premature engine wear. Other examples would be driving the vehicle in an aggressive way before the engine reaches normal operating temperature, constantly doing “jackrabbit starts” and “lugging” the engine (usually seen in manual transmissions). Let’s face it, sometimes an engine design or the materials that are used in the construction of the engine are not up to par. This is probably a little more common than most would think. 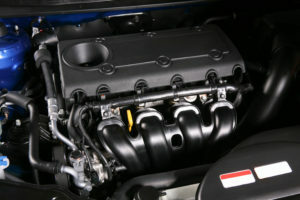 For example, some engines are more prone to sludge build up than others. I have often conducted vehicle inspections in which the customer had records of all of their oil changes, but still experienced pre-mature engine failure due to excessive sludge buildup. We have also seen engines fail due to “material” failures of a particular part or component. This will usually be somewhat of a “pattern” failure. Meaning, the same part will fail (for multiple vehicles) right around the same mileage. If the problem is wide spread enough, the manufacturer will usually issue a technician service bulletin or recall. Detonation and pre-ignition can damage an engine from the inside out. Sometimes known as knocking or pinging, detonation is the spontaneous combustion (not burning in a uniform fashion) of the air and fuel mixture in the cylinder after the spark plug fires. When this happens, there is a sharp rise in pressure and heat in the cylinder. This heat and pressure change puts a tremendous amount of stress on the piston crowns, piston rings, ring lands, head gasket, etc. Pre-ignition occurs when the air and fuel mixture prematurely ignites because of a hot spot in the cylinder. This hot spot causes the air and fuel to ignite before the spark plug fires. Once the spark plug does fire, the rest of the air and fuel mixture ignites, which, like detonation, causes a tremendous amount of pressure in the cylinder. Detonation can be caused by the wrong octane fuel, high engine operating temperatures, lean air to fuel ratios, over advanced timing, inoperative exhaust gas recirculation systems and excessive carbon build-up in the cylinder. In addition, if the vehicle is turbo charged, too much boost pressure can cause detonation. Pre-ignition, on the other hand, is caused by anything that can cause a hot spot in the cylinder. This would include incandescent carbon deposits, spark plugs that are not properly fastened, the wrong spark plugs (incorrect heat range), exhaust valves that are too hot, etc. We didn’t save this topic for last because it is the least prevalent. Believe it or not, the engine can simply fail due to a part being fatigued. From what we see in the field, this is a relatively common failure. Basically, a particular component will no longer meet a design specification or can no longer operate as the manufacturer intended. The repetitive motion of an engine’s internal components can eventually cause a part to wear out over time. Sometimes a failure is isolated to a particular part or area. Unfortunately, one failed part can in turn cause collateral damage to other components. As you can see there are several things that can cause an engine to fail prematurely. If you have any questions or concerns regarding the health of your engine, our ASE certified inspectors are here to help.